Ahab was a bad king of Israel. Elijah was one of God's prophets. One day Elijah went to see King Ahab. Elijah told King Ahab that the Lord God of Israel had said that no rain or dew would fall the next few years unless Elijah commanded it. God knew that Ahab would be mad at Elijah, so God hid Elijah near the Jordan River. 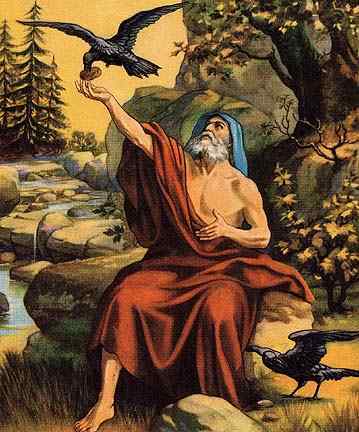 He sent ravens with food to feed Elijah every day. Just as Elijah had said, it didn't rain in Israel for three years. Finally God told Elijah, "Go and meet King Ahab. I will soon send rain." So Elijah told Ahab to bring the 450 prophets of the false god Baal to Mount Carmel for a contest. The prophets of Baal built an altar and put a dead bull on it. They called on Baal to set the offering on fire. But nothing happened. Then Elijah built an altar and put an offering of a dead bull on it. He poured 12 huge jars of water on his sacrifice. Elijah asked God to set it on fire. God sent fire from heaven to burn up the bull, the altar, and even the stones! Then all the people worshiped God. Elijah told the people not to waver, but to choose whom they would serve. If you always try to get your own way about things, who are you serving? Are you serving God, or are you just serving yourself? We must not only think of ourselves, but we must think of what is best for others even if it means we will have to be inconvenienced in order to help someone else. This story about Elijah can be found in the Bible in First Kings chapters 17 and 18. 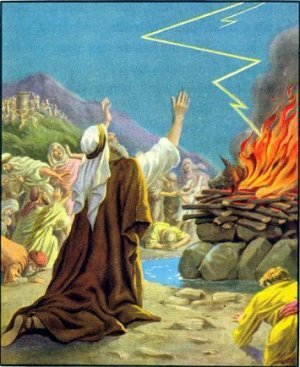 English Bible Activities Select stories #97-102 in the list for activities to accompany this Bible story. Spanish Bible Activities Select stories #97-102 in the list for activities to accompany this Bible story. Purchase a book about Elijah from Philip Williams. Press "Go" to search for books about Elijah. I truly do love Jesus, but I am having a hard time surrendering to HIM. I desire to know more about the bible. I need all your prayers for understanding, memory, and knowledge of his words. I pray that this comment find everyone I good health and spirit. Thank you, this really helped. I love Jesus, and have accepted him as my savior, which is why I wanted to read about Elijah. I am teaching on Elijah and Elisha this term and was wondering how I can get permission to copy some of the pictures in the slideshow. This page displayed 298,741 times.